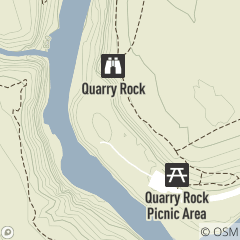 Quarry Rock Picnic Area is located off Solon Rd., west of Chagrin River Rd. An overlook deck affords a picturesque view of the Aurora Branch of the Chagrin River complete with water cascades. Large icicles can be seen clinging to the rock cliffs in winter. A sandstone quarry and the only post office in the area could be found here in the early 1800s.